The Round Ireland Yacht Race is now an established race in the RORC calendar. However, in the 1970’s, the idea of a yacht race right around Ireland, whilst much discussed, was just a dream. In 1975 a race round Ireland with two stopovers, one in Crosshaven and the other in Killybegs, was run by Ballyholme YC. This race started and finished in Bangor. The success of this venture proved that the basic idea was a good one. In 1979, Wicklow SC organised a Round Ireland Rally with a number of stopovers en route, to start and finish in Wicklow. This rally too was a great success and indeed marked the first occasion for the club to win the Club of the Year award. Following this success, a race starting from and finishing in Wicklow, leaving Ireland and all its islands to starboard, was proposed and under the stewardship of the late Michael Jones, the first Round Ireland took place in 1980. Wicklow SC has organised the race every two years since then and 2018 marks the 20th edition of this classic off-shore event. In that first race in 1980, 16 boats started out in Wicklow and 10 completed the race. Two of the race starters were multihulls. The overall winner was Brian Coad in his Rival 34 Raasy of Melfort with an elapsed time of just under 6 days and 4 hours. He went on to compete in another 5 races but in the very next race in 1982 took just over 9 days to finish. Wicklow SC is renowned amongst competitors for its informal and welcoming race organisation. However, the harbour itself is limited both in area and depth and this has created problems in welcoming larger fleets and bigger boats. A base in Dun Laoghaire facilitated by Royal Irish YC was established in 2014, and this has ensured the further development of the race. The current co-ordinator Theo Phelan, who has competed on several occasions himself, is very encouraged by the positive feedback that the race continues to receive, from sailors both at home and abroad. 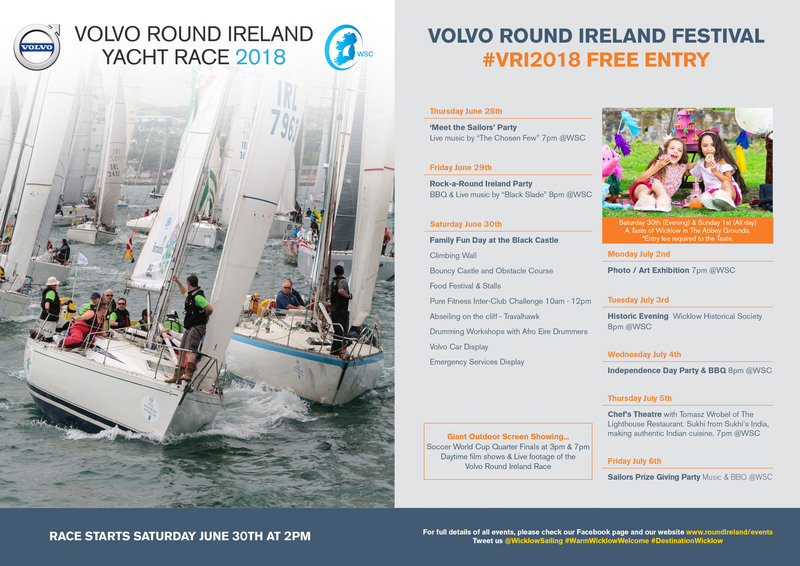 This event is obviously the jewel in the crown of Wicklow Sailing Club and despite the onerous demands it puts on the shoulders of all the members every 2 years, it will continue to be hosted from Wicklow harbour for the foreseeable future. The great Denis Doyle in Moonduster set a record time of 88 hours 15 minutes and 43 seconds in the 1984 race. This was to stand until 1990 when Laurie Smith in the maxi yacht Rothmans managed to cross the line in 84 hours and 56 minutes. Colm Barrington in his Whitbread 60 Jeep Cherokee beat this time in 1998 and finished in 76 hours 23 minutes and 57 seconds. In 2008, Mike Slade in ICAP Leopard created a new record of 65 hours 48 minutes and 47 seconds. The current monohull record is held by George David in Rambler 88 who completed the course in 50 hours 24 minutes and 9 seconds in 2016. This is a far cry from the first time set in 1980! And even further is the record time set by the Sultanate of Oman’s flagship trimaran Musandam-Oman Sail of 38 hours 37 minutes and 7 seconds in that same race of 2016. Race entry numbers climbed steadily during the 1980s until 1990, when 61 boats crossed the start line. However, this was a tough race with strong SW gale and just 35 boats completed. Numbers remained in the 40s and 50s until 1998 when only 26 boats entered, the lowest number since 1984, the third race. The following two races had a similar number of boats entering, and from 2004 to 2014 the number of entrants seemed to stabilise at around the late 30s and early 40s. Then, in that great record-breaking year of 2016, there was a record number of boats entering with 63 boats crossing the start line, and 48 boats completing the race. The record number of completing boats was in 1996 when 55 of the 56 entrants finished the race. At 704 miles length, the race is significantly longer than the Fastnet and with quite different challenges. Most competitors who have completed both races will say that the Round Ireland is a much more challenging race. First there is the mad dash down the Irish Sea, trying to keep the tide; then the rounding Tuskar to face into what are usually the strong prevailing SW winds & seas as far as the Fastnet; after that riding the rollercoaster waves up the west coast, often in gale or near gale conditions, and across the north coast to try to catch the tide at Rathlin Island or face anchoring if tide and wind don’t suit; then the last leg of often slack winds coming down the Irish sea (so much so that competitors have on occasion missed the finish line as they were pulled south by the tide with no wind); finally, in the early days a real hazard was the miles of drift nets cast along the west coast. The Race Organiser has played a key role in the development of the race over the years. Michael Jones – one of the key figures in initially establishing the race – was Race Organiser from 1980 to 1992. Fergus O’Conchubhair took over from 1994 until 1998. Denis Noonan held the post from 2000 to 2010. In 2012 Theo Phelan took over the reins and brought the race to the record breaking 2016 edition. Theo retired in February this year and Hal Fitzgerald is Race Organiser for the 20th VRI race in 2018. Wm Egan & Sons and Irish Boats and Yachting sponsored the first race. Irish TV Rentals sponsored the second race. 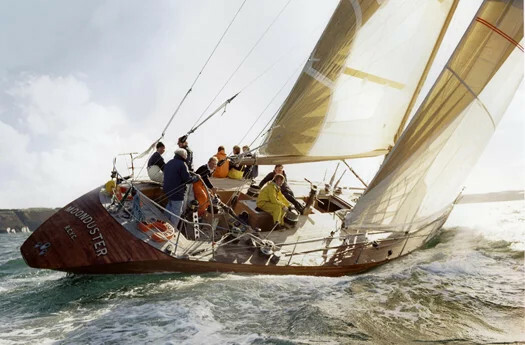 Subsequently, under the sponsorship of Cork Dry Gin from 1984 to 1996, this great offshore test of boat and crew became a major international event on the biennial sailing calendar. BMW sponsored the 2004 – 2008 races and Conway Port sponsored the 2010 race. Current sponsors Volvo Car Ireland came on board as title sponsors in 2016. Many sailors and boats have entered the race on several occasions. In fact, the same names feature again and again and this is one of the beautiful characteristics of the race. James Tyrrell of Arklow SC competed in 12 Round Irelands on various yachts, all named Aquelina. Denis Doyle entered the race with Moonduster 10 times, consistently from 1992, the second race, until the 2000 race. He completed 9 of them, took line honours on 3 occasions and won the race outright on 2 occasions. Colm Barrington also took Line Honours on 3 occasions and won outright twice, but on different boats in each race. Three skippers have won the race twice: Denis Doyle, Colm Barrington and Eric Lisson. No one has won outright more than twice. After the first race, multihulls were debarred from entering until 2016. A two-handed class was introduced in 2004 with 5 entries. GPS tracking was introduced in 2008. For the romantics in our midst, an event of a truly romantic nature occurred on board Ocean Spirit of Carlingford as they crossed the finish line in 2008. Crew member Peter Eagleson went down on bended knee and asked his sweetheart and fellow crew member Emma Finnegan to marry him. To his (and all the watching crew’s) relief, she accepted. Simon le Bon created teeny girl havoc in Wicklow when he arrived on Mazda Drum for the 1986 race. The quays were crammed with young girls all looking to get a sight of their idol. Visually impaired sailor Mark Pollock finished the race in 2010 on a two handed boat with Michael Liddy, spending their last 3 days at sea without electrics or engine.